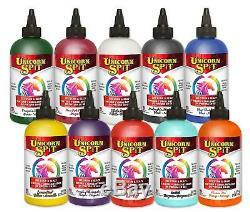 Unicorn SPiT Gel Stain & Glaze in One - 10 Paint Collection 8 oz bottles. UNICORN SPIT GEL STAIN AND GLAZE IN ONE! UNICORN SPiT allows anyone to turn ordinary objects into personalized MASTERPIECES! Use on wood, glass, metal, fabric, pottery, wicker, concrete and laminate. Ideal for creating new - or - refinishing thousands of projects. Excellent for Crafters, Makers, Hobbyists, DIYers and Pros too! What makes UNICORN SPiT so special? It can be used as a PAINT or dilute it with water to create a GEL, GLAZE, STAIN, WHITE WASH or ANTIQUING TINTâ? ¦AND comes in 10 vibrant colors! What substrates does UNICORN SPiT work on? Wood, Glass, Metal, Fabric, Pottery, Wicker, Concrete, Laminate and more! Can UNICORN SPiT be used outdoors? Make sure to protect your masterpiece first with finishes/coatings that are oil-based. Water-based coatings will alter the look of Unicorn SPiT. For a high gloss finish, seal with Famowood Glaze Coat. For better protection and a higher gloss, repeat coats of sealer as indicated on the productâ?? High Gloss Sealers will help achieve a three dimensional look. Will UNICORN SPiT applied to fabric be water resistant and machine washable? Yes, but it must be treated first. Use a product intended for waterproofing fabric after Unicorn SPiT has completed dried. Can custom colors be created? Mix Unicorn SPiT colors together to create your own special color OR mix most any water-based paint (chalk style or mineral based) with Unicorn SPiT to create custom colors. INCLUDES: White Ning, Pixie Punk Pink, Molly Red Pepper, Phoenix Fire, Lemon Kiss, Dragon'sBelly, Zia Teal, Blue Thunder, Purple Hill Majesty, Midnight's Blackness. PAINT, GEL STAIN and GLAZE in One! - see image of colors and list below of colors. Make your project as opaque or vibrant as your dreams require. Use as a PAINT or dilute with water to create a GEL, GLAZE, STAIN, WHITE WASH or ANTIQUING TINT! Penetrates deep into the bare wood grain or glazes over existing finishes, brightens and highlights chalk paint, and provides a 3-D dimensional effect. Jasmine scented - Use indoors or outdoors. Product Dimensions: 10 x 10 x 7 inches. Have peace of mind knowing that your order will arrive original factory sealed packaging. You're already purchasing the item. That means having access to real people that get your questions and concerns answered quickly. Give us a shot and we will make sure that you will look to us again! The item "Unicorn SPiT Gel Stain & Glaze in One 10 Paint Collection 8 oz bottles" is in sale since Thursday, June 15, 2017. This item is in the category "Crafts\Art Supplies\Painting Supplies\Other Painting Supplies". The seller is "greatlakesdiscountshop" and is located in US.